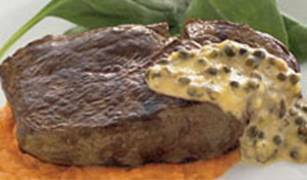 Long Yard Beef Company Pty Ltd Recipes, Hints & Tips. Try some of our famous in store recipes. - Trim meat of any fat. - Frozen meat doesn't need defrosting, just allow extra cooking time and test accordingly. 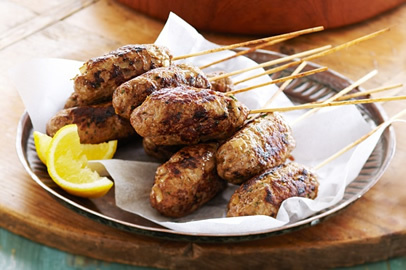 - For extra flavour, marinate meat for kebabs before threading onto skewers. - Soak bamboo skewers in water for about an hour to stop them charring. 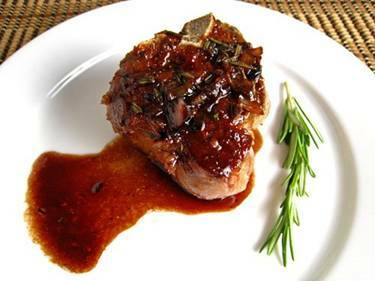 - Rub meat with olive oil and season with salt and pepper before grilling. - Don't turn meat too often or use too low a heat as meat will stew and toughen due to lack of time and heat needed to seal in juices. - Test meat by pressing with blunt tongs; don't cut with a knife as juices will escape causing dryness. 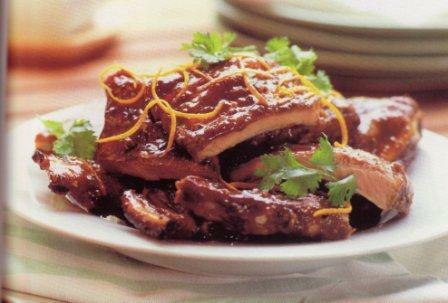 - For extra tenderness and flavour marinate meat in a wine or citrus juice marinade. - Speed up the marinating time by around half by placing the meat in a plastic bag, seal and massage-in marinade for a few minutes then place in coldest part of fridge for around 30 minutes. - Throw a few green gum leaves on the fire (if using a wood BBQ) to give an Aussie bush flavour. - Oil the grill, hotplate or foil to prevent food sticking. When using foil to wrap food, place food on the shiny side, allowing the dull side to face the heat. - Steaks should be at least 21mm thick. - Always defrost steaks in fridge if frozen. - If using a pan, it should be heavy based. - Heat pan, grill or BBQ to hot before putting steaks on. - There should always be plenty of sizzle when cooking steaks. - Brown all sides on a hot pan/BBQ plate. - Slightly reduce heat and cook as required. - Cook for a few minutes per side (depending on thickness). - Cook until steak feels ‘very soft’ with back of tongs. - Internal temperature approximately 35°C. - Cook on one side until moisture is just visible on top surface. - Cook on other side until surface moisture is visible. - Cook until steak feels ‘soft’ with back of tongs. - Internal temperature approximately 45°C. - Cook on one side until moisture is pooling on top surface. - Cook on second side until moisture is visible. - Cook until steak feels ‘springy’ with back of tongs. - Internal temperature approximately 55°C. - Turn and cook on second side until moisture is pooling on top. - Reduce heat slightly and continue to cook until steak feels ‘firm’ with back of tongs. - Internal temperature approximately 65°C. - Reduce heat slightly and continue to cook until steak feels ‘very firm’ with back of tongs. - Internal temperature approximately 75°C. 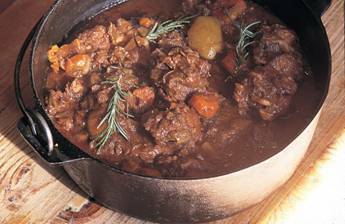 Joshy’s Famous Ox-Tail Stew Recipe! Place the flour and Ox-Tail pieces into a plastic bag and shake until all pieces are coated. Using the Olive Oil, brown off the ox-tail pieces in the pan. Add the rest of the ingredients into a slow cooker or camp oven along with the ox tail and stew for 4 hours. Perfect in the Camp Oven! Preheat oven to 180 degrees C. Line a baking tray with baking paper. Place mince, breadcrumbs, onion, carrot, tomato sauce, parsley and egg ina large bowl. Season with salt and pepper. Using clean hands, mix until well combined. Shape mince into a 10cm x 18cm rectangle. Place on prepared tray. Bake for 25 to 30 min or until firm to touch. Remove from oven. Drain excess fat. Spoon BBQ sauce over top of meatloaf. Return to oven and cook for a further 10 min or until top is glazed. Stand on tray for 5 minutes before slicing. Serve with steamed vegetables and chat potatoes. Heat olive oil in a small saucepan over medium heat and then add the onion. Stir until onion becomes translucent. Add garlic and continue cooking for another three minutes. Add tomato paste and stir through and continue cooking for another two minutes. Add diced tomatoes and beef stock. Stir through and bring up to the boil then take off the heat. 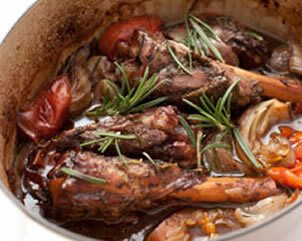 Place the lamb and rosemary leaves into the slow cooker and pour tomato sauce over the top. Serve with Mash and Green beans. Season your lamb chops with salt and pepper. In a bowl, combine the cola, red wine, rosemary and a tiny bit of olive oil. Put the lamb chops in a bowl with the marinade, then cover with cling wrap and refrigerate, for 30 minutes. Cook on a hot barbeque for approximately 1 minute each side of the lamb chop and serve with a salad. Don’t forget to rest the chops before serving! 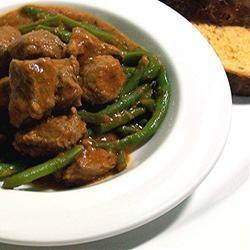 A tasty winter warmer that is great served with damper or green beans. Serves 5-6. Mix flour with 1 teaspoon salt, pepper, curry powder and ginger and coat chops with mixture. Heat half the oil in a saucepan and brown lamb on each side. Cook onion gently in pan until soft. Mix vinegar, sauces, sugar and stock. Layer lamb and onion in casserole dish and pour liquid mixture on top. Cover and cook in a moderately slow (160 degrees) oven for 1 hour. Add pumpkin and cook for another 30 minutes. Serve with hot damper or green vegetables. Mix the mince, onion, garlic, egg, herbs, spices and salt and pepper into a bowl. Bind the mixture together using your hands. Divide the mixture into 8 equal balls then shape them into 8cm long sausages. Push a skewer through the middle of each one then squeeze the sausage around the skewer to make sure firm. Place on a tray, cover and refrigerate for at least 20 min. Make the dip by blending the yogurt with the olive oil, then adding the cucumber and garlic. Mix well then chill until ready to serve. When ready to cook, heat BBQ grill to high, brush Kofta’s with olive oil then place on grill. Reduce heat to low. Cook turning occasionally for 10 minutes or cooked through. Transfer to a tray, cover with foil and rest for 5 minutes. Serve as entree with yogurt dip. 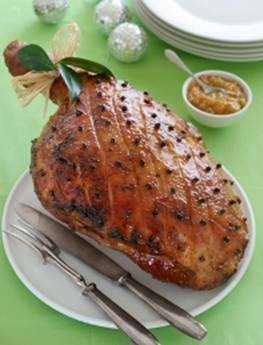 With the Christmas season upon us, we thought it timely to include a recipe idea for a glazed ham. Of course, you don’t need to glaze your ham, they’re beautiful served as they are, but if you’re after something a little different, this recipe will fit the bill. A whole leg of ham will serve 20+. Combine grated orange zest, orange juice, mustard, sugar and cinnamon. Remove skin from ham and score fat in a diamond shape. Press a clove into the centre of each diamond shape. Bake for up to 2 hours, basting the ham with the glaze every 20 minutes. Note: Keep an eye on the oven temperature as the glaze can burn quickly if the oven is too hot. Preheat the oven to 200°C (180°C fan-forced). Use a clean knife-sharpening steel or metal rod to push a hole through the centre of the pork fillets and create a hole; stuff hole with prunes. Brush pork with oil and roll in Salt, Pepper and Rosemary to season. Heat a medium frying pan over medium high heat and cook pork for 1 minute on each side to seal. 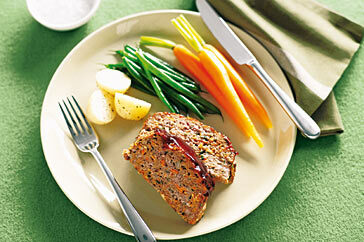 Transfer pork to a greased baking dish and roast for 15 minutes or until cooked to taste. Cut the ribs into 3 bone pieces. Brush them with some BBQ sauce or a purpose bought Marinade. Cover with tight fitting foil and bake in the oven for 2 and half hours, turning once halfway through cooking (top up with the remaining water at the halfway point if needed). After 2 and a half hours remove the foil and coat with more BBQ sauce and bake in the oven for a further 15 minutes, turn, baste with BBQ sauce and roast for a further 15 minutes. After 3 hours of cooking in the oven your BBQ pork ribs will now be succulent (from the steaming) and tender (3 hour cooking time). For the smokey flavour, flame grill them on the BBQ basting with more sauce. You can pre make these ribs and refrigerate the day before if you are wanting them for a bbq or special occasion. To reheat, just put them on the bbq and rebaste them with the bbq sauce. Your friends will love them! Salt & Pepper for seasoning. Place split peas on bottom of slow cooker. Add carrots, celery, onion, bay leaf and ham hock. Cover with water. Season with salt & pepper. Cook on low 6-8 hours or high 4-6 hours, until meat is falling off the bone. Remove bone. Discard fat and skin. Chop meat and return to soup. Serve with some crusty bread rolls. 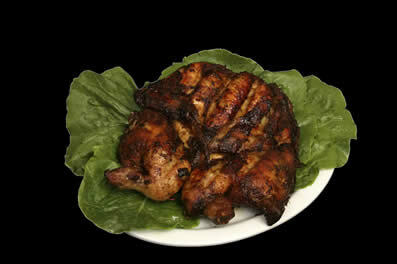 Place chicken onto a hot BBQ grill plate and cook 5 minutes per side. Use a flipper to turn as it may stick to the BBQ. Turn the heat to low and cook for a further 5 minutes each side. Place on a chopping board, cover with foil and let rest. Fried Rice - Whisk 4 eggs together and pour into hot greased pan, making sure the whole pan is covered. Once egg cooked take out with a flipper and place on chopping board. Chop into small pieces. Add splash of oil, bacon, onion, garlic and frozen peas to the pan and fry off until onion translucent and peas soft. Pour in cooked rice and soy sauce and stirfry for 2 minutes. Turn heat off and add egg pieces and salt and pepper for seasoning. Remove foil from chicken and chop into 2cm pieces. Serve chicken on top of rice in bowls and drizzle with Sweet Soy Sauce. A family favourite at our house. Heat oil in a saucepan over medium-high heat. Add onion and garlic. Cook, stirring, for 3 minutes or until onion softens. Add the chicken and pumpkin and cook, stirring often, for 8 minutes or until the chicken is cooked through and the pumpkin starts to soften. Remove from heat. Stir in the cream and dip. Season with salt and pepper. Preheat oven to 180°C. Brush a 6cm-deep, 21 x 32cm ovenproof dish with oil to grease. Spread a thin layer of chicken mixture over the base of the prepared dish. Top with 2 lasagne sheets. Spread with one-third of remaining chicken mixture. Top with one-third of the spinach and one-quarter of the mozzarella. 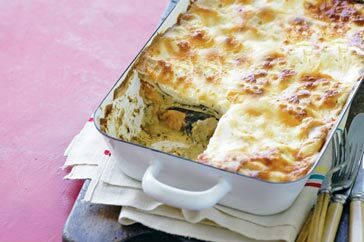 Continue layering with remaining lasagne sheets, chicken mixture, spinach and two-thirds of the remaining mozzarella, finishing with lasagne sheets. Top with the ricotta and remaining mozzarella. Bake in oven for 40 minutes or until golden and cooked through. In a large stockpot combine chicken pieces, chopped onion, chopped garlic, water, chicken stock and pepper. Bring to boil. Reduce heat to low and cook, covered, for approx 40 minutes. Use tongs to transfer the chicken to a clean work surface. 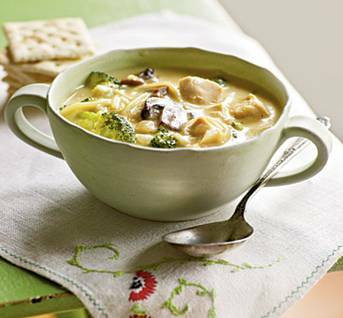 Add packet of broccoli, fettuccine, torn basil leaves and can of cream of chicken soup to the chicken broth. Bring back to boil, stirring frequently then reduce heat. Cook until the pasta and broccoli are soft. Cut the chicken meat from the bones. Discard Bones. Chop the chicken meat and add back to the soup. Season with salt. 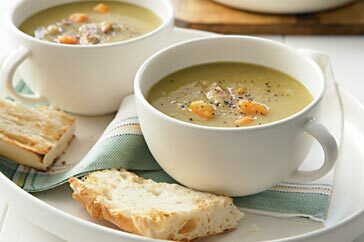 Ladle soup into serving bowls and serve immediately. Slice the chicken breast into small strips. Add peanut oil to pan with chicken strips, marinade, honey and garlic. Cook until brown and remove from heat. Place 1 sheet of rice paper in medium bowl of warm water until softened. Lift sheet carefully from water and place on a cutting board. Place 2 strips chicken horizontally in centre of rice paper, top with carrot, lettuce, mint leaves and peanuts. Fold corner facing you over filling, roll rice paper to enclose filling, folding in one side after first complete turn of roll. 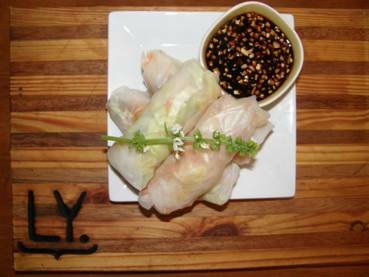 Repeat with remaining rice paper sheets and fillings. Mix all sauce ingredients together and serve in a small bowl for dipping. Perfect for a light lunch or entree. A very simple and very delicious sauce. Great on top of your steak or corned silverside. Place seeded mustard, garlic and cream in a small pan, bring slowly to the boil, and reduce heat to simmering point. Simmer until the mixture is reduced by half. Stir in chopped chives and serve immediately. Quantity makes enough for 4 steaks. 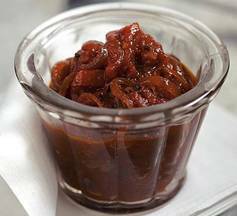 Perfect smothered over barbecued meats, piled high on a hamburger or enjoy with ham or turkey. Place onion, peppercorns and red wine vinegar in a medium heavy based saucepan over a high heat and bring to the boil. Reduce heat to low and simmer, covered, for 40 minutes or until onion is soft. Add sugar, salt and balsamic vinegar and cook, stirring, until sugar has dissolved. Increase heat to medium high and boil for 25 – 30 minutes, stirring occasionally, or until mixture is thick and syrupy. Stir in thyme. Use a large spoon to remove scum from surface. Spoon relish into hot sterilised jars and seal. Invert jars for 5 minutes, then turn right way up and set aside to cool completely. Serve or gift wrap. Mix all the ingredients of the Dressing in a saucepan. Stir well over low heat until sugar is dissolved. 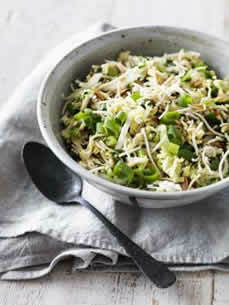 Combine the Cabbage, chopped Green Onions and almonds in a salad bowl. Add dressing and mix well. Just before serving add the noodles and toss thoroughly. I could eat a whole bowl of this just by itself! Make sure you eat it all as it goes soggy and can't be eaten later. All you need is any kind of cooked pasta (I usually use Penne), 2 tbs pesto, a handful of toasted pinenuts, Cherry tomatoes halved and some fresh basil or baby spinach leaves. Mix it all together and you have a beautiful side dish! 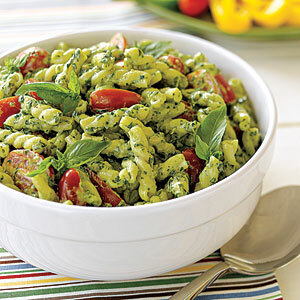 You can really add whatever takes your fancy to this salad as the base is just the pasta and pesto sauce. Olives are also nice or you can make it a main meal by adding some cooked chicken. I love it as it is so versatile. Hope it becomes a favourite of yours too! Place Cous Cous and sultanas in a bowl. Pour over the boiling water. Cover and stand for 5 minutes. Add finely grated rind and the juice from oranges. Stir gently with a fork to break cous cous up (if you leave it stand for too long it will get gluggy) Cover and stand for 1 minute. Add almonds and parsley/mint and stir with fork again. 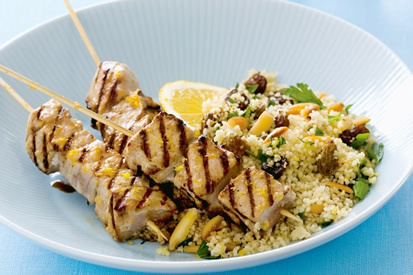 This dish is served with Orange and Ginger marinated Fish skewers. 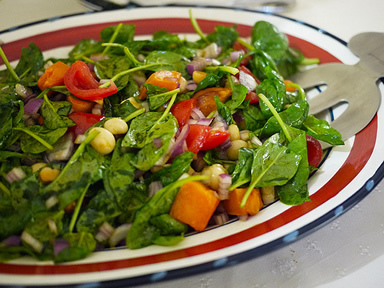 Add the baby spinach, red onion and tomato to a serving bowl. Peel and dice the sweet potato and sauté in oil until golden. Put aside to let cool. Toast the macadamia nuts in frypan until coloured. Add the sweet potato and nuts to the salad and drizzle the Balsamic over the top. If I don't have any macadamias I use toasted pinenuts. If you haven’t guessed by now.... I love nuts in my salads! !